Managed File Transfer (MFT) is a reliable and guaranteed delivery file transfer service with all the management, error handling and recovery features built in for a secure and encrypted file transfer. It supports managed file transfer across any of the file transfer protocols (be it FTP, SFTP, FTP over SSL etc..) and various file systems (Windows, Linux/Unix, mid range systems, S3, Object Stores, Cloud Storage etc.). The file transfer is secure and encrypted and tracked through the transfer and in-transit processing providing a reliable enterprise grade MFT platform for managing the secure transfer of data from source location to one or more destinations through public, private and hybrid network. RoboMQ MFT service allows you to transfer files between file systems using variety of file transfer protocols. The Managed File Transfer platform is built on the strength of RoboMQ Message Oriented Middleware(MOM)providing guarantee delivery reliable data transfer. It utilizes the RoboMQ broker for receiving and tracking events identifying each steps of transfer and in-transit transformation. In addition to regular MFT functionality, you get following silent advantages while using RoboMQ. The MFT service needs to talk to your RoboMQ tenant, therefore you will need to provide your vhost or tenant ID, username, password and your preference for secure transfer overssl. Those folders don't need to be under the same directory. Actually they can and often do reside on different servers, file systems or S3 buckets. Note that you will need to provide credential of the accounts for accessing those file systems and make sure those accounts have read and write permissions on the above specific folders. In case that you need some files under those folders but don't want them to be transferred, you can configure a filter to ignore files with names that match a certain pattern. At this point, the MFT service configured and is ready to work. 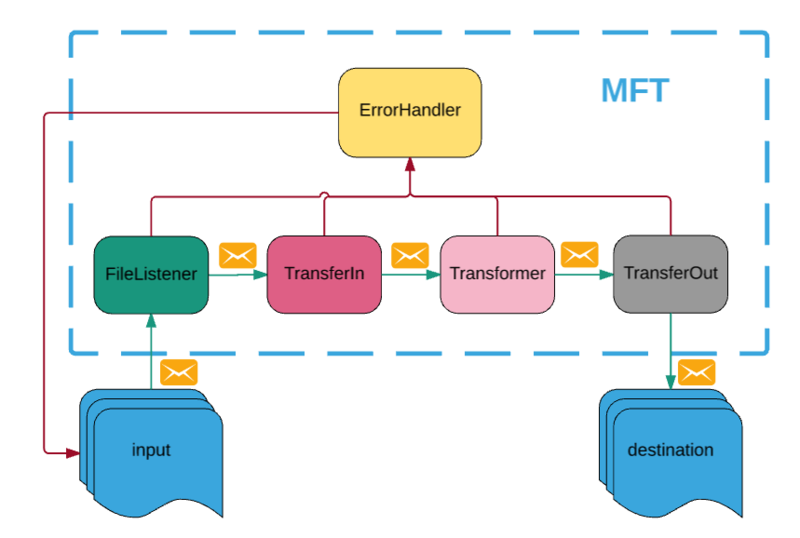 The following picture depicts a typical MFT file transfer flow. MFT has a file listener, it scans the upload folder on a configurable interval. Once a expected file detected, it will be copied to one or more inbound folders (multiple MFT services can work together in case the file needs to be duplicated and processed at multiple destinations). If file requires specific validation or transformation, an optional MFT Microservice can perform transformation, validation or data enrichment on the file in the inbound folder. After successfully processing the file, this component moves file to outbound folder. Finally another MFT Microservice will pick it up from outbound folder and put it into destination. Note that just like with any integration with RoboMQ there could be a whole chain of Microservices performing variety of functions including transformation, validation, data enrichment or application of any business logic while file is in transit from source to the destination. At each step of the processing, the original successfully processed files are archived in corresponding archive folder. Upon any failure at any point, the current file will be moved to corresponding error folder. 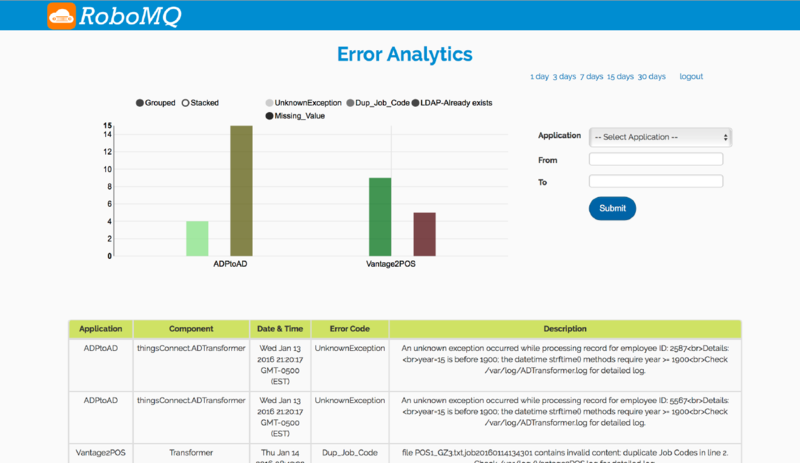 At this point RoboMQ error handling process kicks in which is robust and has multiple options for tactical as well as strategic handling of error case. An error message (includes file information) will be sent to an error queue and an notification message (describes what is the error and how it happened) will be sent to an notification queue.